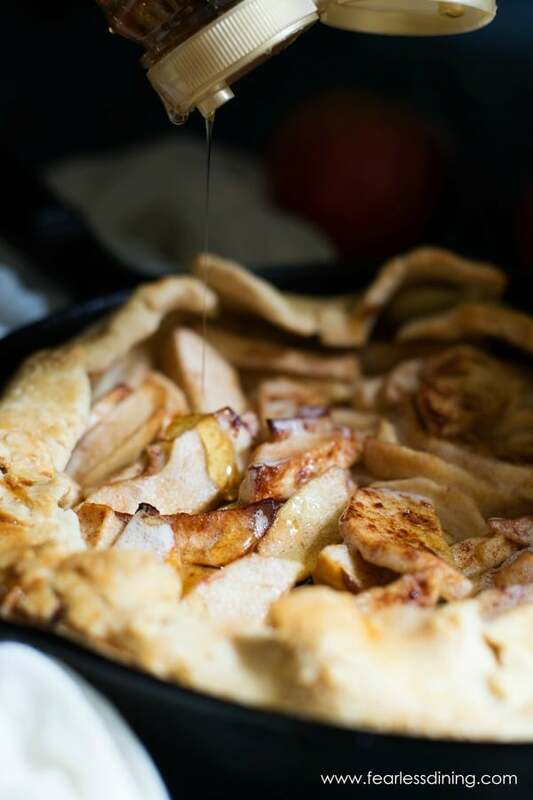 Honey-Apple Gluten Free Galette is the best gluten free galette recipe to make with fall apples. The addition of pure honey as a natural sweetener compliments the apples’ flavor, and is healthy, too! 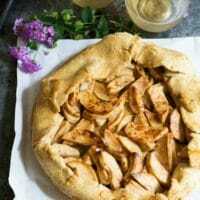 If you love honey and apples, this beautiful gluten free galette is a delicious dessert recipe to try this fall. Cinnamon and apples are a delicious combination that is sure to please anyone looking for a gluten free dessert recipe to try this fall. It is National Honey Month and we are celebrating! Honey is a delicious natural sweetener that is perfect to use in both sweet and savory recipes! Did you know I have now been blogging for over three years? It feels like time has gone by so fast. In all of this time, I have never created an apple pie. That is one of the most popular pie recipes and I feel like I have neglected my duty to share a delicious pie recipe with you. 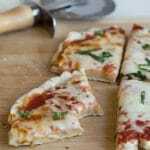 I know gluten free crust can be tricky, but this recipe is very easy to follow! Well, I didn’t quite make a gluten free apple pie, but I did make a delicious gluten free apple galette for you. 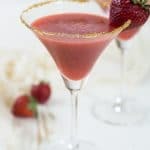 While I am making my confessions, I must also admit that I made this gluten free dessert recipe for a special date night with Mr. Fearless Dining. 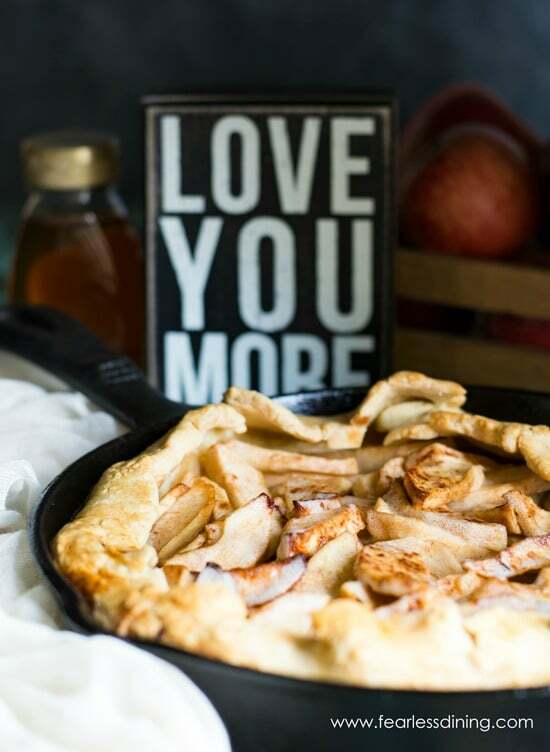 He LOVES apple pie and I have a feeling this galette will help make a special memory for our date night. 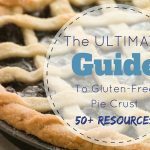 Don’t forget to check out these 50+ Incredible Gluten Free Pie Recipes! 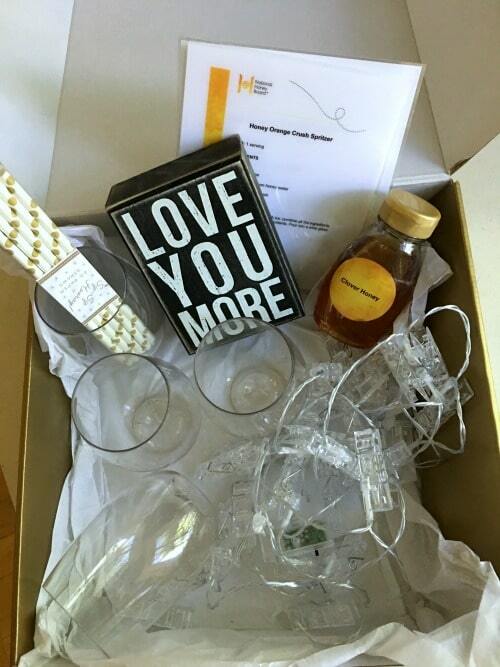 To celebrate National Honey Month, the National Honey Board paired up with Lifestyle Expert Camille Styles to send a romantic date night box to celebrate. I can’t wait to decorate our dining room to set the scene! I am sure you all know what an apple pie is, but do you know what a galette is? Think of a galette as a sloppy pie. You take your favorite gluten free pie crust recipe and roll it out into a thin circle, just like you were going to make a gluten free apple pie. The big difference is that you roll the crust out and then put the fruit or other pie filling in the center of the pie crust. 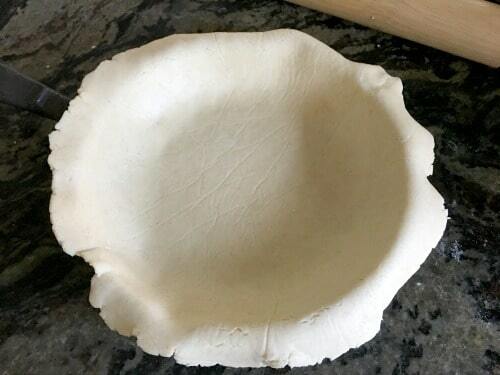 Fold the pie crust over the topping so that the center is uncovered by the crust. Bake and eat :-). The star of this easy apple galette recipe is the honey. I used honey to sweeten this instead of sugar. Honey helps make these sweet moments memorable! What type of apples are best to use in galette or pie filling? 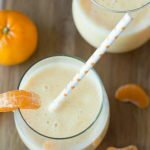 I prefer to use Granny Smith apples in this recipe, though I must admit the few organic Granny Smith apples in our market were not very fresh. I opted to use a red apple, the Jonagold Apple. I like this apple as well. Tart apples are best for pies and galettes. Don’t use a Red Delicious as they don’t have the tartness to stand out once you introduce the sweetener. Cut cold butter into the dry ingredients. I love using my pastry blender to do this quickly. 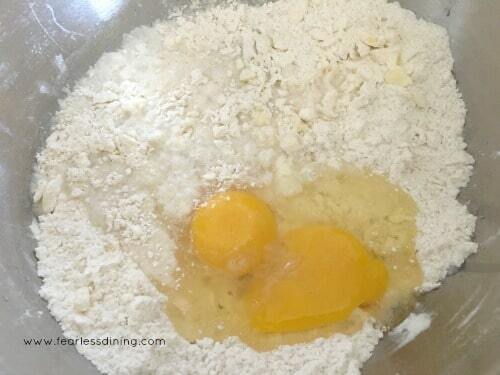 Add raw eggs and the other wet ingredients and mix until a ball of dough forms. Lay out the dough into the cast iron pan. Fill with your pie filling and fold the sides over the fruit. 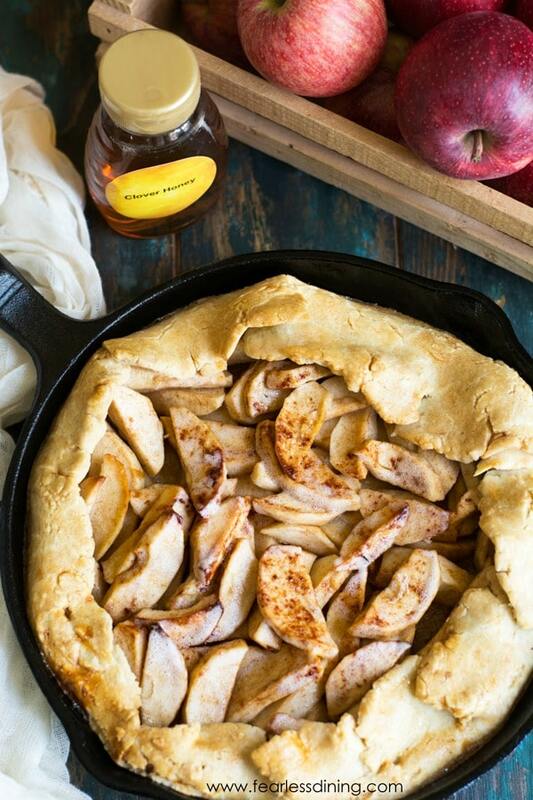 An easy gluten free honey apple galette recipe made in a cast iron skillet. In a large bowl, add flour and salt. Mix well. 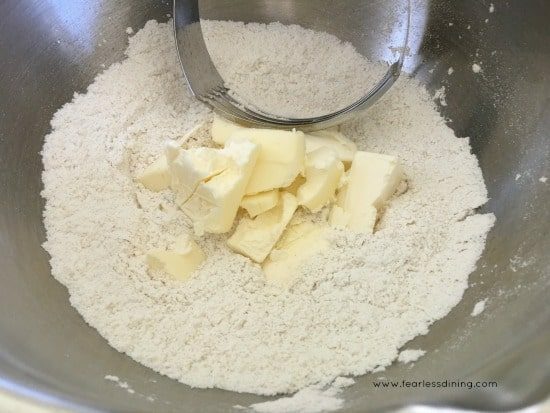 Add cold butter and use a pastry blender to cut in the butter. Add the egg, lemon juice, and water. Mix well until it forms a dough ball. Place the dough on a piece of wax paper. Cover with another piece of wax paper. Use a rolling pin to roll into a flat circle about 1/4-1/2 inch thick. Press the crust into a cast iron skillet. If you don't have a skillet, put the dough on a cookie sheet. Add the apple honey mixture in the middle of the dough. Fold the crust over and pinch to seal edges. Bake for 30 minutes until apples are cooked and crust is golden. I just made two of these and they look beautiful n so easy to make. I’m taking them off to two Thanksgiving dinners. I’m sure the will please many! Thanks for the recipe! Apple season is one of my favorites! I love the rustic look of galettes. This recipe would be a great use of the apples I picked this year!! The date night box is a lovely idea. I do like that it is National Honey Month, so many delicious recipes that can include honey, such a good ingredient. Your apple pie looks and sounds amazing, and is a classic fuss free dessert that is guaranteed to please. Lovely. This looks lovely, it’s so perfect for autumn! 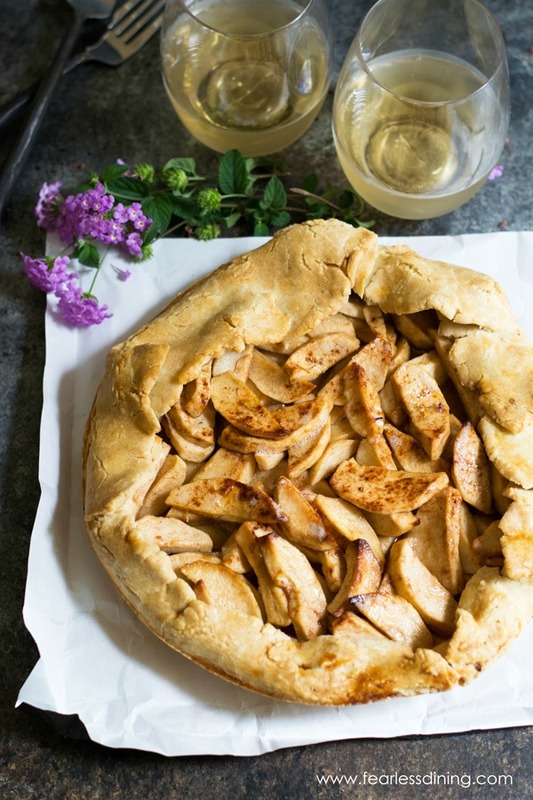 GOSH, Sandi – your apple galette looks gorgeous! And that’s one heck of an awesome-looking gluten free crust! Hoping you and Mr. Fearless Dinning enjoy y’alls date nite! Thank you so much Shashi. Our date night was wonderful. We definitely need to have them more oftn :-).